When you live in Seattle you don’t always have the opportunity to add onto your home in the normal ways. Most of the homes in Bothell, CD, Cap Hill and West Seattle are all built very close together. Many of us have neighborhood associations that regulate what we can do to expand and/or add to our homes. However, sometimes we just really, really need some more space in our homes. If you’re one of us living in Seattle and think that you can’t go up any more, then maybe you should think about going down. If you've been thinking about adding a basement, then your neighborhood plumbing professional at Fox Plumbing & Heating has some thoughts to help keep you informed. Recently, Plumbing Professional, Rick M. was called out to a Fox friend’s home in Seattle. The family asked Rick to provide an estimate to assist with the process of adding a basement to their home. They were working with a contractor who had recommended Fox Plumbing & Heating. Rick appointed Chad F. to lead this project. Under the guidance of Rick, Chad came up with a plan to execute the plumbing needs for adding a basement. While Chad was working on the set-up he realized that we’d need to a add sewage ejector pump, this is a device that allows a home to continue to pump sewage out of the home when the home sewer line is below the side sewer line. The contractor then came in and had to access the floor where the water and sewer lines ran to and from the home. These were then disconnected to ensure that they wouldn't be damaged while the home was being raised. 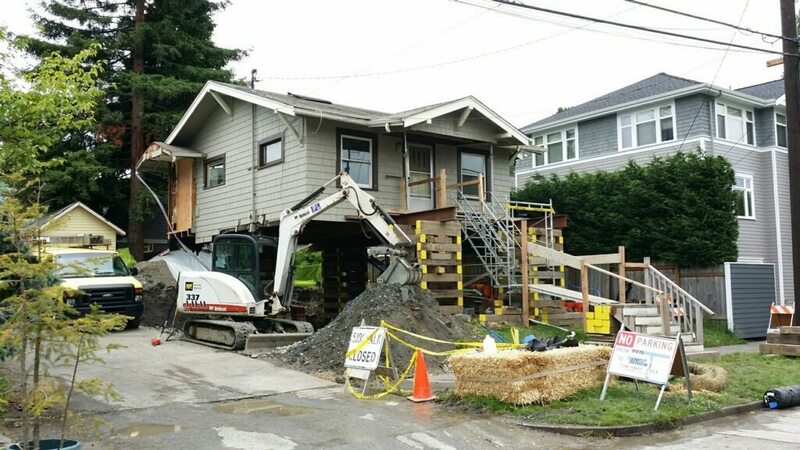 Then the contractor came in, jacked up the home and began digging the basement. To ensure that our customers had running water and sewer, Chad installed temporary connections to the water and sewer lines. Because not everyone can just move out for a week, while they’re adding a basement, we needed to ensure that the family was able to have working water and toilets in their home. No matter what the job, Fox Plumbing & Heating is here to help ensure your home stays your home. It took the contractor several days to finish digging and laying the new foundation and basement. Once this was done, then it was time to reconnect the sewer and water line. Chad came back and turned off the water to the home and removed the temporary water and sewer lines. Then the home was lowered back onto the foundation. Chad reattached the sewer and water line to the home. He also installed the sewage ejector to the home. The whole process took about 5 days, and the family had a brand new basement. Finally, Chad had an inspector come out to insure the connections were correct and test the pressurization of the water lines. Fox Plumbing & Heating has over 50 years of premium experience in exceeding our friends, neighbors and family members’ expectations as Seattle and King County’s #1 Most Trusted Plumbing and Heating Service Company.